In the previous article Ekaterina Bazyleva, Manager at a1qa, encouraged our readers to actively use JIRA to manage agile projects. Today Ekaterina shares her professional secrets: she lists the JIRA functionalities that can make the manager’s life so much better. When there are many tasks on the Board and you plan to discuss one of them during the daily Scrum meeting, what do you do? Most probably, you put a sticker on your monitor not to forget about this very issue. However, there is another option, which is more convenient: flag an issue on the Board and it will be displayed in yellow. All flagged issues can be found with the JQL query Flagged = Impediment. To find the Burndown Chart you have to open the Agile Board and go to the Reports. If you need to track several sprints and several teams, you’ll have to constantly switch between them. There is a way out. Add the Burndown Gadget to your dashboard and get the opportunity to monitor teams’ work. The more teams you have, the more Burndown Gadgets you have to add. Customize the cards for your boards and you will help the team members to see the right information at one glance. You can add up to three additional fields to be displayed on cards. It can be an issue assignee (if you have a big team, it’s not always easy to understand the responsible person by his or her small photo) or the Fix Version (good option if you have many different environments). The number of fields to choose from is really huge. There are many teams that plan the workload on the sprint planning stage. The Workload by Assignee table will show you whether the work is evenly spread between the team members. 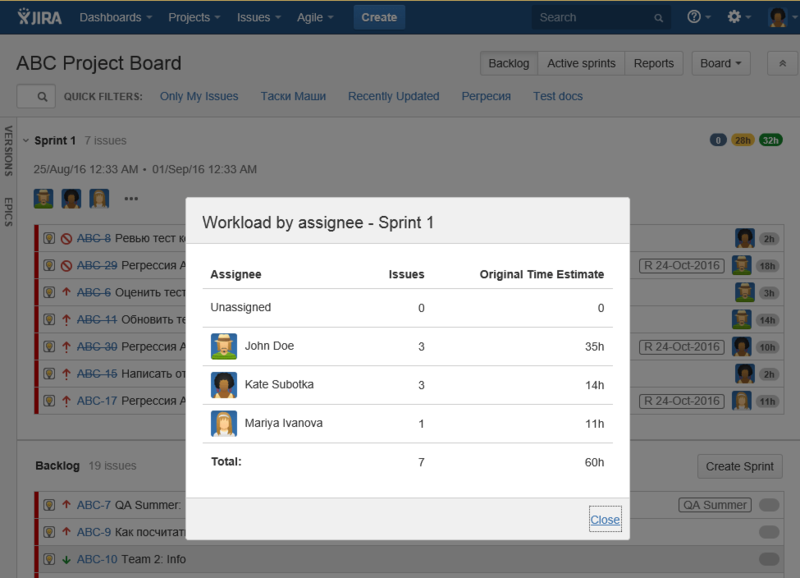 Besides the Scrum Board, there is also a Kanban Board available in the Agile Plugin. It will suit, for example, the QA outsourcing projects where the situation changes on a daily basis. There are no team limits and issues change their status as soon as they are completed. The majority of the settings are the same as for the Scrum Board. The manager’s task is to update issues priority when needed. The Kanban Board doesn’t involve a lot of planning and will go well for those issues that can’t be planned such as production bugs, users’ requests to the support service, background tasks. a – Will open the Assign dialog box. I hope these tips & tricks will be of help to you. Remember them tomorrow when you get down to work. What JIRA features do you use regularly? Share them in the comments!